Kauai's best kept secret! This boutique establishment offer just 24 units with compact condo units, right on the ocean. 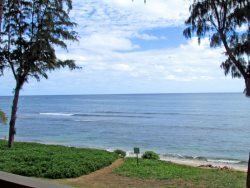 This quaint Hawaiiana oceanfront complex is on Kauai's east side. Each unit is individually decorated by its owner, and they are very comfortable, with everything you need for your vacation. There is no air-conditioning in the units, as the tropical breeze with windows on 3 sides of each unit, keeps the units cool. Once an Shinto Temple, now a majestic place to stay for your vacation.